New hires are the most diverse, but overall, the diversity of Apple's workforce still has room for improvement. For Apple, being the most innovative company means also striving to be the most diverse. On Wednesday, the iPhone maker released its annual diversity report, pointing to an increase in the last year of hiring women and minorities. According to Apple’s Inclusion & Diversity Report, 54 percent of new hires were racial minorities and 37 percent were women. In addition, Apple claims to have closed the pay gap in the U.S., offering equal pay for equal work. The company is currently analyzing salaries, bonuses, and stock options for employees around the world. "If a gap exists, we'll address it." Furthermore, 27 percent of new hires were racial minorities who’ve been historically underrepresented in tech (Black, Hispanic, Native American, Native Hawaiian, and Other Pacific Islander). Overall, Apple’s new hires in the last year are more ethnically diverse than the company’s current employees. The report takes into account new hires in the 12-month period ending in June 2016. 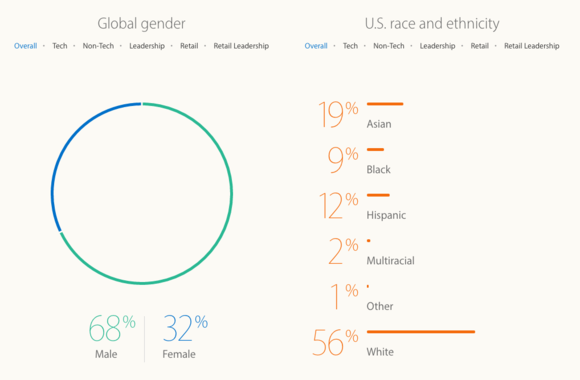 Data about minorities comes from the U.S., and data about female employees is counted across the globe. 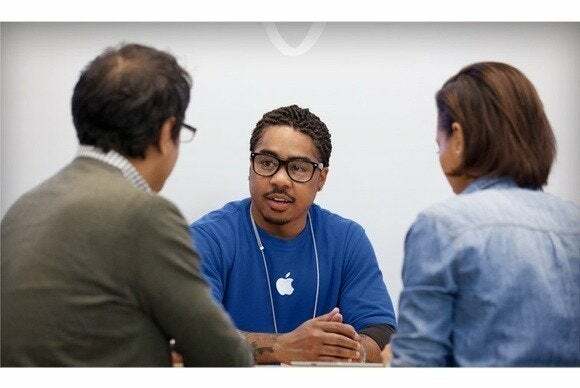 While Apple continues to increase the percentage of new employees who are women and minorities, the diversity of the new hires does not seem to be greatly affecting the overall diversity of Apple’s workforce. Since 2014, the number of female Apple employees around the world has increased by just 1 percent each year, from 30 percent to 32 percent. And the number of white Apple employees in the U.S. actually went up by 2 percent in the last year, from 54 percent in 2015 to 56 percent now.